MOSCOW, September 16. /TASS/. The Russian embassy in Serbia is taking efforts to release Russian journalist Oksana Sazonova and her colleague, Ukrainian national Sergey Belous, a source in Russia’s Foreign Ministry said. "Russia has received with concern the information on the detention of Russian journalist Oksana Sazonova and her Ukrainian colleague Sergey Belous in Kosovo, the autonomous province of the Republic of Serbia, overnight to September 16," the Ministry’s source said. "According to the preliminary information that we have obtained, the Kosovo police are accusing them of illegally crossing the administrative border between Kosovo and the rest of Serbia." "The Russian embassy in Serbia and its office in Pristina, with the help of the UN Mission in Kosovo and the EU Rule of Law Mission in Kosovo are taking intensive efforts for the speedy release of the journalists,’ the source said. "We expect that these international missions in Kosovo, that has been under UN administration since 1999, will provide all necessary assistance." On Thursday, Russian journalist Oksana Sazonova and her Ukrainian colleague Sergey Belous were detained in the self-proclaimed Republic of Kosovo. Zvonko Mihajlovic, an ethnic Serb residing in Kosovo, who was employed as a driver for the journalists, told TASS that they were filming footage and interviewing the locals. "On Thursday, we were in the town of Velica Hoca, where some policemen came up to us and asked the journalists to present their passports and visas. They didn’t have any Kosovo visas, so we were all taken to the police station and held there for three hours, after that we were taken to Pristina," Mihajlovic said. According to him, the reporters were put in a police car and he had been told to follow in his automobile. On arriving to Pristina, Mihajlovic’s passport was given back to him, but the journalists were taken to a police station. The driver was told that they were going to be taken to a crossing point at the Serbian border to be deported. However, no one elaborated on when it was going to happen, Mihajlovic noted. He added that the journalists’ cell phones were turned off, so there was no way to contact them. Belous has been cooperating with the Belgrade media centre "Ruski Express" (translated as "Russian Express") while Sazonova is the chief editor of the News Front portal in Serbia. The journalists are most likely to be taken to court, and subsequently fined and deported, renowned Serbian lawyer Goran Petranovic told TASS. Petranovic is a co-founder of the "Ruski Express" media center, which works with Sazonova and Belous. The attorney did note that there is a slim chance they could get a prison sentence, but this, he believed is highly unlikely to happen. According to the lawyer, "the journalists are going to be appear in a Pristina court today to face charges of illegal border crossing." 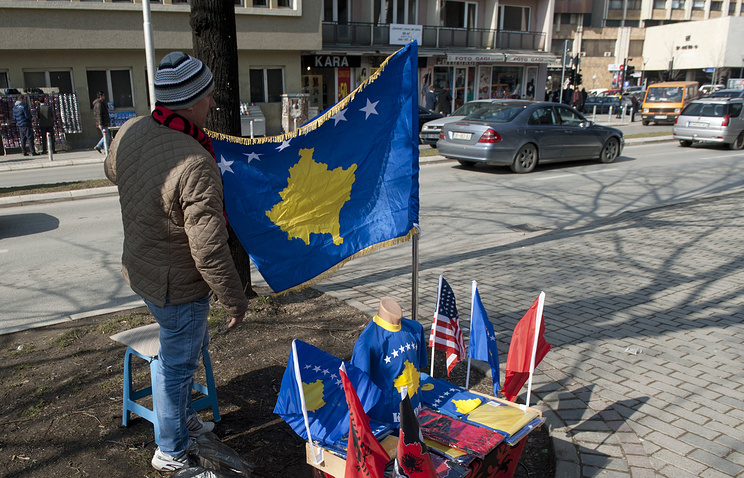 The self-proclaimed republic has introduced visas for Russian nationals, but it is easy to enter Kosovo from Serbia without crossing the checkpoints set up on the administrative border.